Want to put your company on the map? There are many ways you can approach your marketing in order to get eyeballs and grow your business. From press releases that result in media mentions to a great paid campaign for your social media page, and from an ad that gets you seen in search engines to a commercial on TV or an ad on a website, there is no shortage of opportunities to grow your online footprint. A lot of people use the aforementioned tactics to build visibility. When you think about it, online marketing typically encompasses the three standard marketing components: SEO, social media marketing, and PPC. That’s your SEM (search engine marketing) in a nutshell. But what people don’t seem to recognize is that there are other creative tactics to use within SEM that could be incredibly valuable to your company’s bottom line. Lots of companies are using free tools and resources as well as education to power massive customer acquisition. In this article, I’d like to showcase five companies that have created significant resources which really helped grow awareness of their product. Inbound marketing company HubSpot is your classic example. Years ago, it launched to appeal to a niche audience of marketers by creating the now defunct Twitter Grader, which would grade your presence on the social media platform. At the time, the social media space was abuzz with news about the tool, and everyone wanted to share their statistics. The result was significant awareness (the company went public last year). While Twitter Grader doesn’t exist anymore, HubSpot replaced it with a more ubiquitous (and more appropriate for its product offering) Website Marketing Grader. 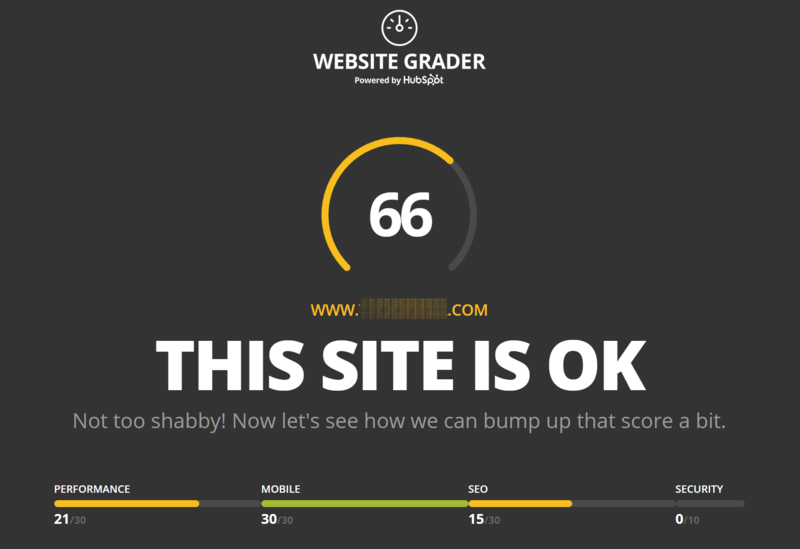 But, now, even that’s out of date, so HubSpot is building a better version at Website Grader. Once you grade your site, you get pitched to try out HubSpot’s service offerings, all of which can help with your website presence online. By doing this, HubSpot not only offers a tool that’s relevant to what it does, it also captures leads regularly. What you can learn from HubSpot: Product-based launches that are relevant to your business are best. Offer a tool that will lead people to want to know how to “fix” the problems you identify for them. If you haven’t checked out Groove yet, you should. It’s one of my favorite blogs, and if you have a look, you’ll see why. GrooveHQ is a relatively simple helpdesk application for small businesses. Beyond having a really great interface, their customer experience goes far beyond the product offering. Their blog is a goldmine of great content, and it keeps on getting better and better. Groove has three blogs. Their main blog is the Startup Journey, and it is authored by their insanely intelligent CEO, Alex Turnbull. In it, Alex talks about his journey and gives tips on how people can learn from other businesses just like his. For example, he talks about how he grew his email subscription base to 50k, how to manage remote teams, and what he learned from failing to hit his 12-month growth goal. 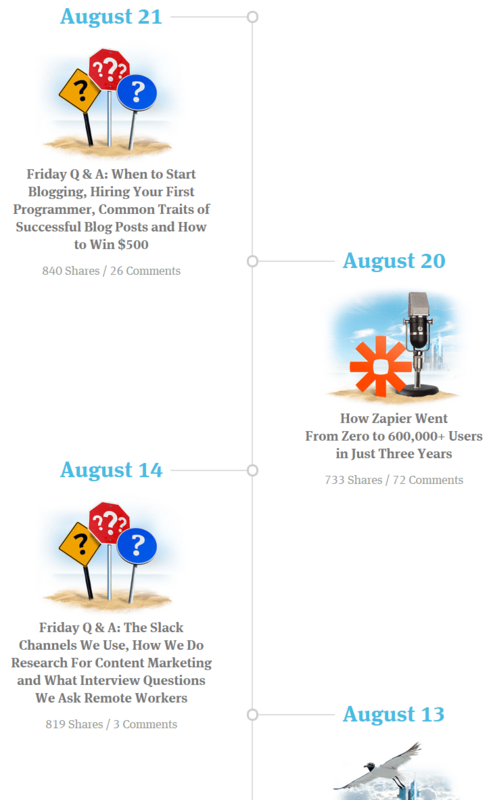 The blog is beautifully designed, giving readers a true chronology of his successes (and failures). Groove’s second blog is the Customer Support blog. True to its name, it covers topics related to customer support, such as a weekly customer service maintenance checklist and articles on how to reduce the number of customer service emails you get, how to deal with bad reviews of your business, and how to turn your most unhappy customers into brand promoters. 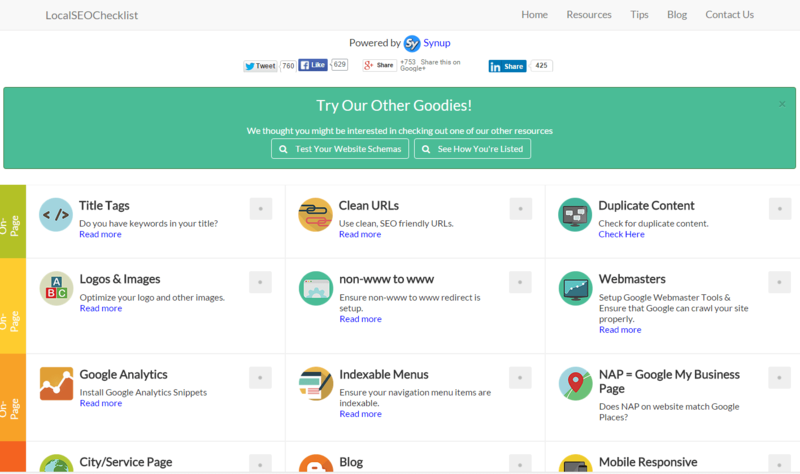 It is chock full of good content, as is their third blog, which is product-oriented. The Product blog covers new feature additions written in such a way as to engage the reader. It also covers topics like “how Company ABC switched to Groove,” product hacks (i.e., how to make the product better with some hacking), and more. The way these posts are written is refreshing and really conveys a true interest in connecting with the reader. It’s not your typical educational blog. It is passion in (digital) print. No wonder Groove is growing so much. What you can learn from Groove: If you write amazing content, your business blog can soar above the rest. It’s even better if you are transparent about your journey as a business, discussing your successes and failures so that people can really identify with you and the situations you describe. Synup, a local listings tool, has been really making waves in the local SEO space. Earlier this summer, it launched the Local SEO Checklist to help anyone working on local SEO to learn what steps need to be taken to ensure their local website has the best possible SEO. The tool is totally free, and it is a true checklist of every step necessary to grow a local online footprint. Synup’s tool has worked. Their service has attracted thousands of new users in the past three months who needed to do more with their local SEO. After all, Synup’s offering is tangential to review monitoring for small local businesses. This complements the standard local SEO tips wonderfully. With the checklist, one will learn the steps it takes to be visible, while their review offering gives companies the tools to maintain positive visibility. What you can learn from Synup: Customer acquisition can be jump-started by offering value-added functionality that enhances what you already offer, especially if it is tangential to your product offering. With Synup’s checklist and its review management solution, one gets a great grasp of local online marketing. Zapier is a tool that connects apps you use and helps you automate tasks to get more out of your data. For example, you may want to use Zapier to add a Google Calendar entry to your to-do list or add basic information from LinkedIn contacts to a Google Spreadsheet or send emails directly to Slack. Zapier has grown on me, especially through their great content promotions. Beyond their blog (which is incredible, just like Groove’s), they also have a learning center with more exhaustive guides that are way too big for a standard blog post. My favorite, by far, is “The Ultimate Guide to Remote Work” because it speaks to my lifestyle as well. As you can see, not only are these guides beautifully designed, they are also pretty informative, too. The Ultimate Guide to Email Marketing talks about how great emails are made, the top 25 best apps, how to grow your subscriber base, how to segment email lists, how to import/copy/remove subscribers, the basics of drip marketing with 25 tools to do so, the best 7 tools for transactional emails, how to a/b test, 21 mistakes to avoid, and how to keep sending great emails. In other words, there are 15-20 blog posts in one super cool and informative eBook. And it’s free. This puts Zapier’s amazing service in front of many people who would be interested in learning more about what they have to offer. 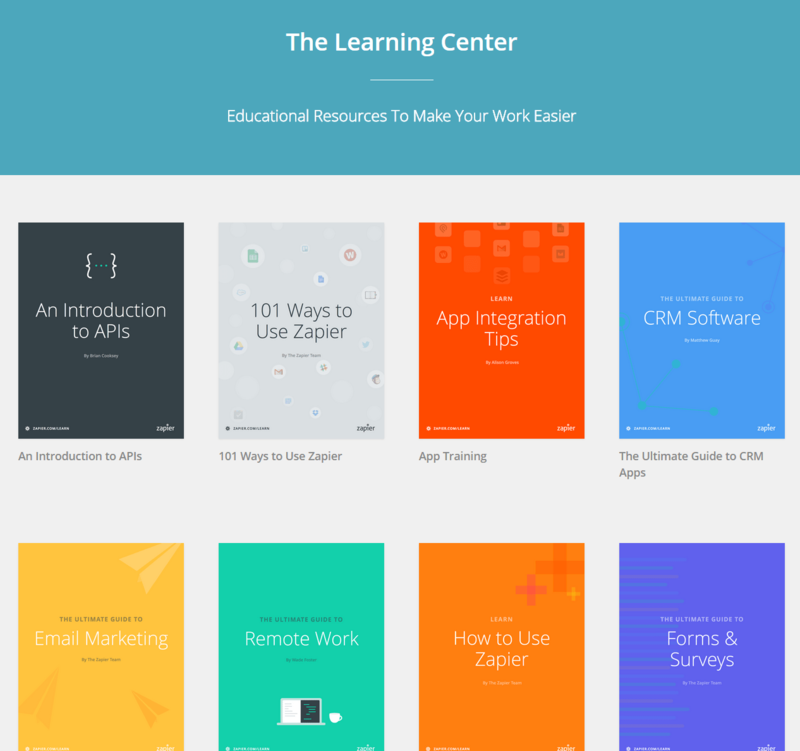 What you can learn from Zapier: Going a step beyond what Groove did, rich pieces of informative content that read like eBooks are fantastic ways to acquire customers. Significantly, they shouldn’t be boring whitepapers, but rather cool content about a variety of topics that would be of interest to your audience, even if they’re not actually about what you’re selling! Dropbox is one of the world’s topmost file sharing and storage tools out there, allowing people to easily store their most important files online with cloud backup and redundancy. Files can be synced from one computer to the next seamlessly. Dropbox has gotten better and better through the years and has enhanced its offering substantially. While Dropbox has a lot of business applicability, it also has a lot of personal applicability. Dropbox encourages users to automatically upload photos to its platform, and that’s synced to its Carousel gallery app. 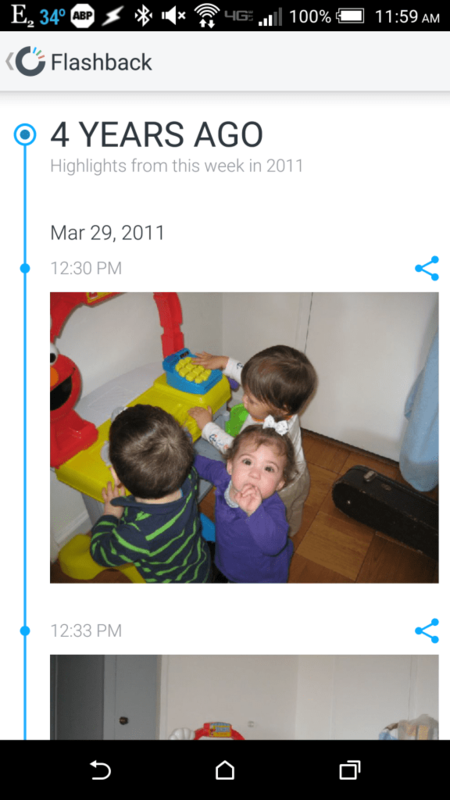 Carousel advertises itself as a “lifetime of photos, simplified.” It’s an amazing organizational tool for photographs, allowing users to see the photos anywhere. This app can also help you review what you’ve been doing in previous years, giving you small flashbacks into your life in the past. These flashbacks are similar to a lesser-used Facebook feature (and what Timehop already does), but they are far more appropriate to the medium in this case. Since Dropbox stores files from the past and the present on the cloud, having photographs with a historical perspective at your fingertips is not just fun but applicable to the primary tool. Carousel is an optional download that simply enhances the Dropbox experience. What you can learn from Dropbox: Offering tools that make your service more appealing to use is a great way to acquire customers. Your SaaS service or business may not be very exciting, but adding small tools that make product usage fun (even if it isn’t directly correlated to your business offering) is another great way to acquire new customers. There are many terrific ways to market your product. Creating content or an app to enhance its presence online is an excellent way for your brand to stand out. Has this article inspired you to create something outstanding? Then I hope you do so and reap the benefits. About the Author: Tamar Weinberg is a professional hustler and author of The New Community Rules: Marketing on The Social Web. She blogs about all things tech, productivity, and social media customer success at Techipedia.